Cameron Knopp, the lead singer and primary songwriter of alternative rock band Never Loved, is not 37 years old. At least I don’t think he is. It’s really none of my business actually, but I’m 37 years old, and that’s significant because during the height of alternative rock’s ascendancy into the mainstream, I was glued to every single, every album, every music video that was released by Nirvana, Pearl Jam, and the Smashing Pumpkins. I don’t think Cameron Knopp was. Yet as you listen to his work as Never Loved, you could be mistaken that his music was the direct result of being present in that era. 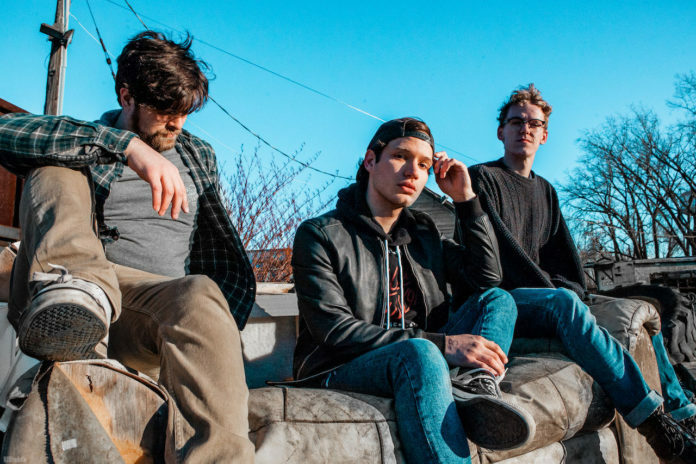 Never Loved just released their debut self-titled EP on Equal Vision Records, and in its 4-songs, blaze through the best sounding guitar-heavy alternative rock we’ve heard in decades. Songs like “Charged” bring sludgy, mid-tempo guitar fuzz that evokes the kind of songwriting once associated with Corgan, Lanegan, and yes, Cobain. The work Knopp has accomplished in just four songs is proof that those artists’ work is timeless- still influencing and shaping artists years later. We compare the music of Never Loved to these memorable names, but maybe someday we’ll compare new musicians who craft music this good as artists influenced by Cameron Knopp. Four songs in and it’s a good bet. Knopp took some time out of a busy touring schedule to talk to us about his songwriting, his musical influences and a little insight into the music of Never Loved. Congrats on the EP- how does it feel now that it’s done and released for the everyone? I love the musical diversity of the EP- while its rooted in alternative rock- you’re able to traverse many genres and sprinkle different aesthetics on the music. What kind of music did you listen to growing up? It means a lot hearing that. In my early childhood I’d listen to bands I’d find in my parents CD collection. Some bands that really resonated with me were AC/DC, Van Halen, Nirvana, and The Offspring. As I moved into my teenage years I got into bands like Sum 41 & Green Day. Nowadays I listen to everything and anything. You’ve written a lot of different kinds of music, would you say this EP is the most accurate representation of who you are musically? I’d say this is the most accurate representation of who I am musically to date (at least what’s public); however, there’s still so much more that’s yet to be heard & I’m always evolving as a person/writer/musician/etc. This EP showcases some of the different sides I have musically & emotionally; it’s a nice sample of what’s to come in the future. If you had to pick 4 albums that you grew up with that helped mold your sound, what are they? Love this question, let’s go. Green Day’s American Idiot, Nirvana’s Nevermind, Offspring’s Smash, and Sum 41’s All Killer, No Filler. I’m quite partial to “Charged”, it really does take me back to a time when music was a little more raw, frenetic. Do you have a favorite track of the bunch? How did you end up working with Matt Squire? I was in contact with him prior to Never Loved when I was working with another project, so I just sent him some demos I was working on at the time and we went from there. Best label in the world. What’s in store for you in 2019- you’re on the road right now- is it more touring or is there a full-length in the works? More touring, more writing, and keeping up the hard work. Never Loved’s debut EP is available now on Equal Vision Records.